Super Seal Heat Shrink Wrap Around Sleeves are a crosslinked polyolefin "open tube" which is folded around a cable or pipe conduit and then is zipped closed with a stainless steel channel that can be heat shrunk for a moisture proof seal or can be wrapped without heating for a friction fit cable repair. Power shut down is not required with a wrap sleeve repair application. Hot melt provides a complete environmental seal and insulation up to 1.1KV. Each sleeve is manufactured with high resistance to UV rays, chemicals, corrosion and fungus. 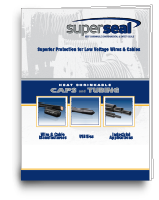 All Super Seal wrap sleeves meet IP 68 (Ingress Protection) requirements. The wrap sleeves are made from same thermally stabilized, cross linked polymeric material as our end caps and low voltage tubing. High Shrink ratio covers irregular shapes. Quickly recovers for cost efficient repairs. The wire/cable shall be thoroughly cleaned prior to placing properly sized wrap sleeve over cable. Evenly apply heat from heat gun or propane torch. Begin to shrink one end of the wrap sleeve first and continue to apply heat to the sleeve first and continue to apply heat to the sleeve by moving towards the opposite open end. Apply heat until the entire sleeve is firmly fitted to the cable. Sealant will flow from the open ends. Allow sleeve to cool.